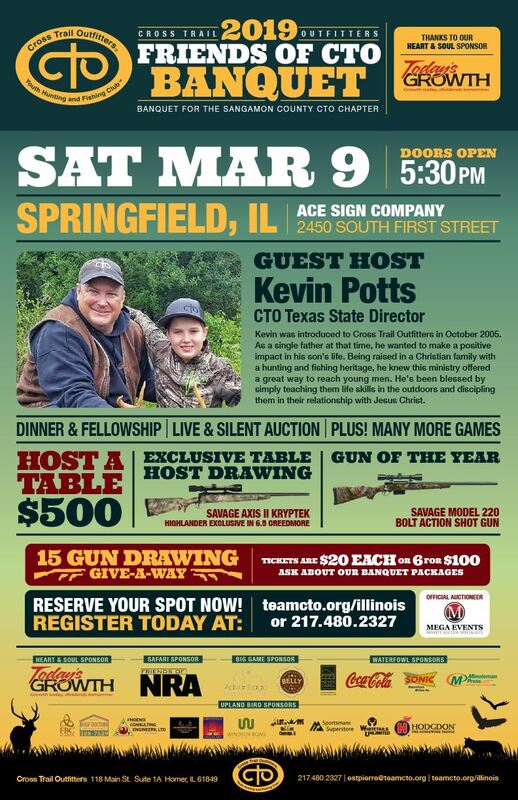 Please join us for the Cross Trail Outfitters of Illinois 2019 Sangamon County Chapter Friends of CTO Banquet on Saturday, March 9th 2019 and help us in Guiding the next generation to Christ by Building Men, Preserving our Heritage and Sharing our Faith. Doors open at 5:30 with dinner served at 6:00 pm. The evening will include Dinner, Live Auction, Silent Auction, Bucket Raffle Drawings, 15 Gun Raffle Drawing, Games and more. You can Host (purchase) a table for 8 for $500 or half a table for $300! Buy an individual ticket for $100 or two tickets for $150. This is one event you won't want to miss!